Product prices and availability are accurate as of 2019-04-19 12:26:42 UTC and are subject to change. Any price and availability information displayed on http://www.amazon.com/ at the time of purchase will apply to the purchase of this product. On the package,we put a soft case ,cleaning cloth and small screwdriver with both plain and cross head tips for many adjustment if needed in the future. Polarized sport driver sunglasses,men alike, whether you're into vocation, travelling,driving, walking, sports and more.Anti-glare and anti-radiation, good for night driving, outdoor use. Polarized sunglasses can selectively eliminate the reflection from light coming from above the water surface while normal sunglasses don't have that function. 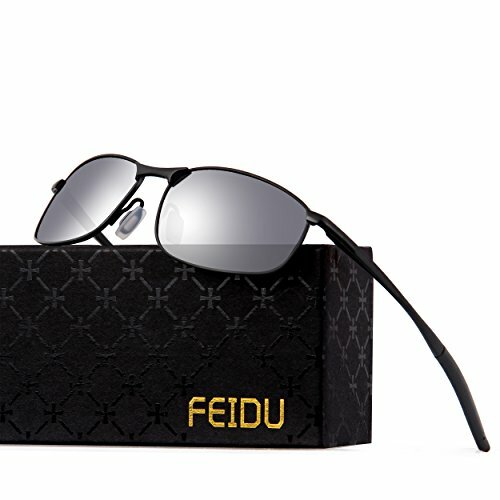 TAC POLARIZED LENS :100% UV400 protection coating, blocks 100% harmful UVA & UVB Rays and protect eyes perfectly. TAC lens includes 5 layers. The 1st layer is polaroid layer. The 2nd and 3rd layers are adhesive layers to enable durability. The 4th and 5th layers are UV 400 protection layers to absorb UV light. FLEXIBLE AND DURABLE GRATE WEARING EXPERIENCE - Our polarized driving sunglasses not noly have the fashionable Driving style but also have the Humanized Design. Elasticity frame and Silicone nose pad give you different wearing feelings. HIGH VISION LENS PROTECTE YOU EYES FROM GLARE - The polarized sunglasses help you have a high clarity vision in front of you to see clearly and more comfortably. LIGHTWEIGHT MATERIAL HEAVY DUTY SUNGLASSES - Lightweight AL-MG alloy design is ideal for usage by motorcycle and cycling bicycle, driving, running, fishing,racing, skiing and climbing, trekking or other outdoor activities enthusiasts. LIFE TIME GUARANTEE ON AMAZON. 30-Day Money Back Guarantee. 24-hour customer services before purchase and after sales. 2-Year Warranty.If you have any issue,please email to us or Facebook we are here to help you!